Poul Henningsen was born in Copenhagen to the famous Danish actress Agnes Henningsen. He never graduated as an architect, but studied at The Technical School at Frederiksberg, Denmark from 1911-14, and then at Technical College in Copenhagen from 1914-17. Danish architect Poul Henningsen, known by his initials, "PH" was obsessed with light. He is the legendary creator of the lighting series carrying his name. He can be said to be the world's first lighting architect. Poul Henningsen devoted his entire career to investigating the importance of light for our well being. He worked on the theory that the observer should not be subjected to direct glare from the electric light source. Henningsen used a series of layered shades to both spread the light and conceal the light bulb, thus creating a softer more diffused lighting. He started practicing traditional functionalistic architecture, but over the years his professional interests changed to focus mainly on lighting which is what he is most famous for. He also expanded his field of occupation into areas of writing, becoming a journalist and an author. For a short period at the beginning of WWII, he was the head architect of the Tivoli Gardens in Copenhagen. But like many other creative people, he was forced to flee Denmark during the German occupation but soon became a vital part of the Danish colony of artists living in Sweden. Poul Henningsen's pioneering work concerning the relations between light structures, shadows, glare, and color reproduction—compared to man's need for light remains the foundation of the lighting theories still practiced by Louis Poulsen Lighting. Louis Poulsen is the only authorized manufacturer of Danish design lamps and lighting by Poul Henningsen. Louis Poulsen lighting is sold exclusively through authorized lighting stores such as Stardust specializing in authentic modern design classics. Louis Poulsen is known as the producer of the legendary PH-lamp and Artichoke Light. Poul Henningsen's lifelong collaboration with Louis Poulsen Lighting began in 1925 and lasted until his death. To this day, Louis Poulsen Lighting still benefits from his genius. Louis Poulsen pendant lamps come in a wide variation of styles and color finishes, all can be sourced from Stardust. Poul Henningsen continued to design for Louis Poulsen well after these early successes, and in 1958 he produced yet another classic – the majestic Artichoke lamp. Based on the same principle as the multilayered shade, the Artichoke employs leaf-like elements to compose the form. With its grand size, the Artichoke creates dramatic atmospheric lighting appropriate for elegant commercial settings and larger domestic spaces. 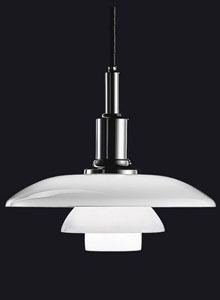 Another Henningsen design classic is his Danish modern masterpiece, the PH Pendant Lamp. Composed of concentric tiers of reflective painted metal bands, the PH design was carefully based on scientific analysis of a lamp shade's function. The goal of even distribution of light and reduction of glare determined the size, shape and position of the shades. Variations of the PH lamp design were made to accommodate various functions and spaces, and within a few years of its introduction the PH lamp was being used in world-class institutions and homes across Scandinavia. Poul Henningsen was also the first editor of the company magazine NYT. The CEO of Louis Poulsen at the time, Sophus Kaastrup-Olsen, gave the magazine to PH as a gift because he had been terminated from the Danish newspaper he worked for (his opinions were too radical). Louis Poulsen lamps from Stardust are truly timeless and are a fine presentation of the Danish modern design style, each PH lamp is marked by functionalism and simplification of forms. Shop Poul Henningsen lighting, PH & Artichoke at Stardust + receive Free Shipping and a 110% Low Price Match Guarantee. Stardust; the best design shop in town™, buy modern home furniture and designer lighting!